This recipe is a great one to have on hand. It's a quick meal with very few ingredients that you probably already have in your pantry. I've made it twice this month! It's also cheesy and delicious. By the way, I love patty melts. I had no idea. It starts with mushroom gravy, which is incredibly easy. Just saute mushrooms in a saucepan. 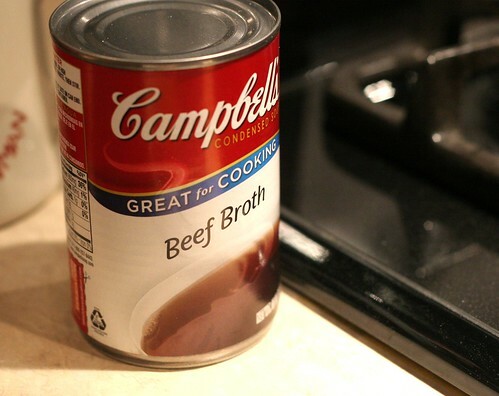 When they are nice and brown, add a can of beef broth. Let the broth simmer until it reduces to about half. I thickened it with about a tablespoon of flour, then whisked it with salt and pepper to taste. It's so perfect for this. You don't want anything too over-powering for the sandwich. 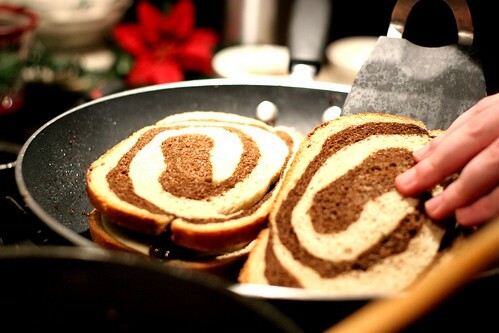 It does need to be thick because I spread it on the bread like butta, baby. Now for the burgers. I used extra lean ground sirloin. I love how the beef flavor comes out in the burger when there is not much fat to compete with. I didn't use any seasoning for the meat except salt and pepper. 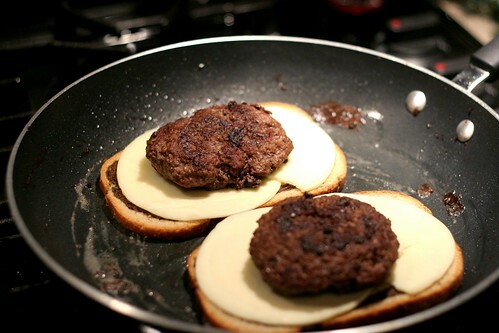 Make the patties thin and long so they fit on the bread slices nicely. Cook for about 5 minutes on each side, or until they are done according to the way you like them. After the burgers are cooked and the gravy is ready, it's time to assemble the sandwiches. Put some butter in a skillet. Not a bad start. 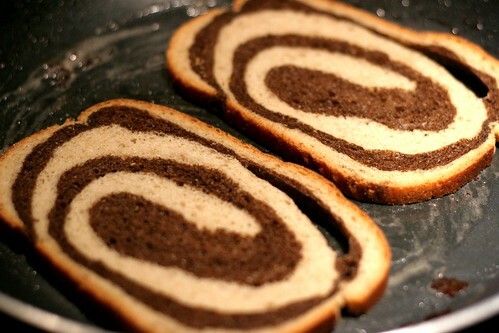 I used rye/pumpernickel swirl. I wasn't trying to be fancy, I just like the flavor. Okay I was trying to be fancy. I like to use an extra half a slice of cheese to make sure the whole slice is covered. I used provolone because it's delicious. Cheddar or swiss would be great too! 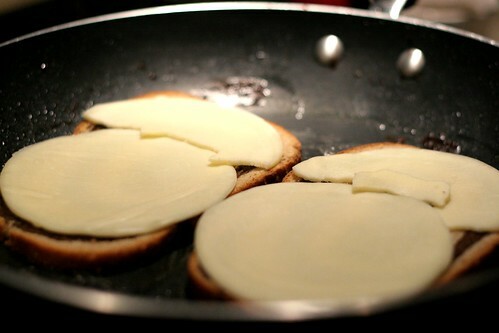 I can hear Giada in my head when I think about provolone cheese. Pro-vo-loan-ay! 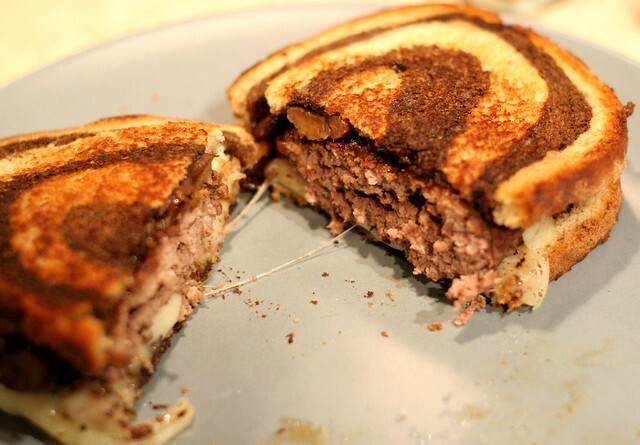 Plop a freshly grilled burger on top of the cheese. Then spread that delicious, thick mushroom gravy on the top slice and put it in its final resting place on top of the burger. I basically just told you how to make a sandwich. Do you feel like I insulted your intelligence? I hope not. Let's put it this way: I taught you how to make this sandwich. Now that we all feel better, flip the sandwiches! It's a beautiful thing. Add some more butter to the pan for extra crispy bread. It's warm, flavorful, cheesy... so good. I love the authentic, fresh flavor from the burgers. You don't need a ton of steak seasoning to make good quality ground beef taste great. The natural flavor is incredible. These would be great served with baked vegetable chips. It's a fantastic week night meal to keep in mind when you are in a hurry, but you want something delicious and homemade. 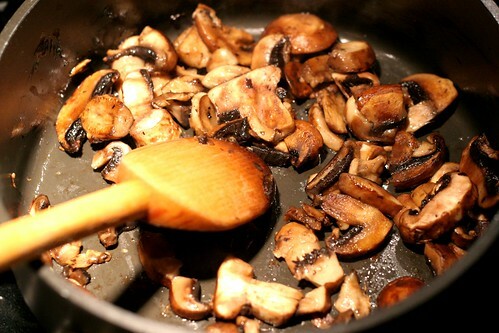 Saute mushrooms in a saucepan with oil over medium heat about 5 minutes. 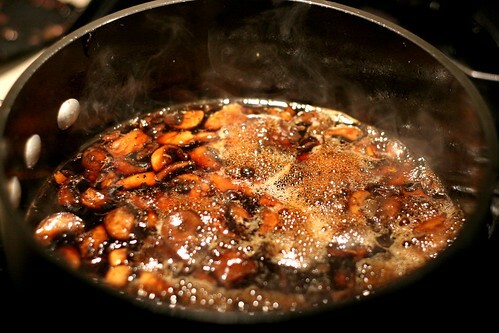 When mushrooms are brown and soft, pour in can of beef broth and stir. Let the gravy simmer until it reduces to half, about 7 to 10 minutes. Add flour and whisk until combined, until desired thickness. Season with salt and pepper and set aside. 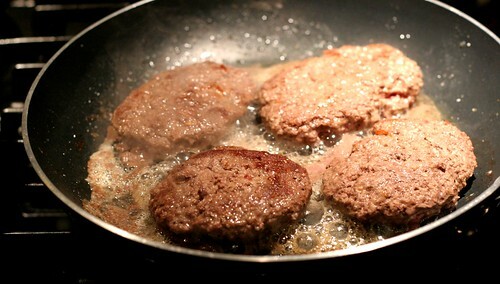 Assemble the ground beef into 4 long, thin patties. Season with salt and pepper. Cook in a skillet over medium high heat for 5 minutes on each side. Put the burgers to the side when they are done. Over medium heat, melt butter in a skillet. 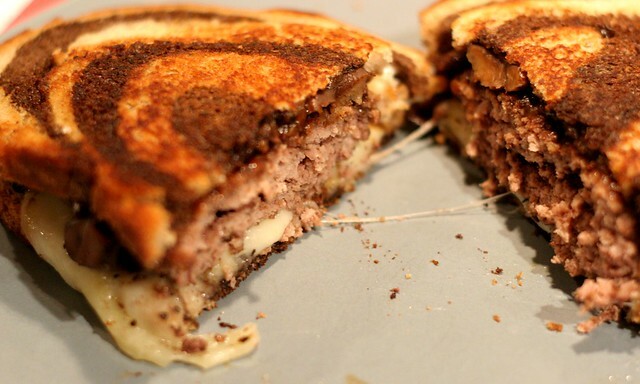 Assemble the sandwiches: bread, cheese, burger, gravy, bread. 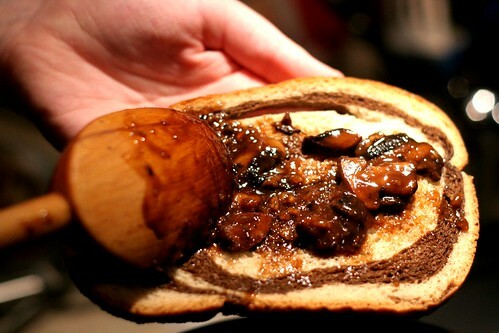 Spread the gravy on the top slice of bread. 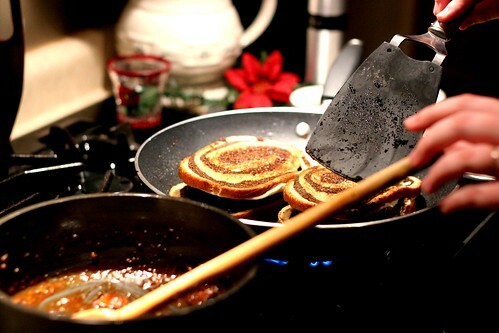 Grill sandwiches until the bread is toasted. My, that recipe looks sooo delicious. We made these last night...um wow.